Ferrari unveiled its 599 GTB Fiorano hybrid coupe at the Geneva auto show. Ferrari wants to offer hybrid versions across its entire lineup within the next three to four years, the Italian automaker's chairman Luca di Montezemolo said. The Ferrari executive made his comments at the press presentation of the sports car maker's 599 GTB Fiorano hybrid coupe model at the Geneva auto show Tuesday. 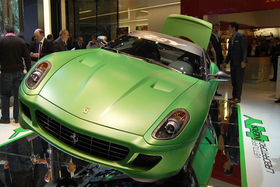 Ferrari showed a prototype of its 599 GTB Fiorano with a hybrid powertrain called Hykers. HY stands for hybrid, while KERS is a contraction of the Kinetic Energy Recuperation System, which the company used during the 2009 Formula One racing season.